Hello everyone, today I am doing another World of Darkness Library article. This time, I am going to be looking at my favourite game system & setting in the World of Darkness, and that is Vampire: The Dark Ages. The focus of this article will be primarily be on the setting of Vampire: The Dark Ages and I will be making comment on the 20th Anniversary Edition. 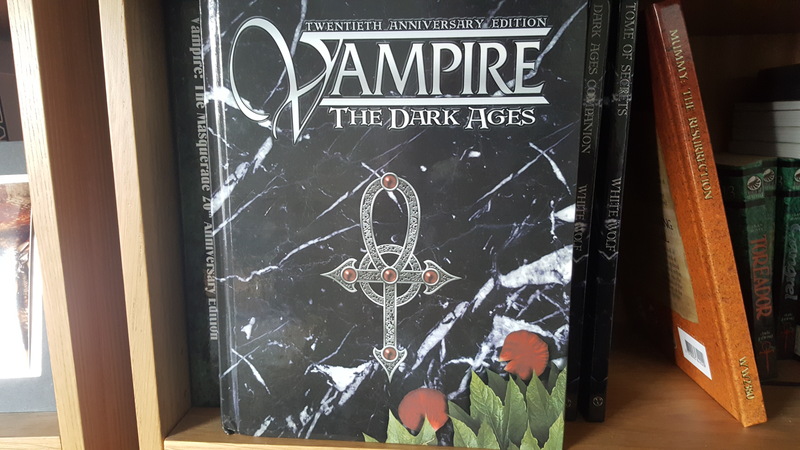 And as the production quality is of the same high standard as previous rulebooks and there are a lot of similarities between Vampire: The Dark Ages and Vampire: The Masquerade, I don’t believe I will need to dwell overlong on this. As with all other World of Darkness games, the setting is bleak. However, that would have been true regardless of playing in a game set in the middle ages. (Despite the title – the Dark Ages were a bit earlier according to my understanding). The world is a rural place with small towns or villages being the most common population centres with only the occasional city thrown into the mix. Travel is by foot or by mount, generally, which means travel is long and perilous, particularly for the damned. The countryside abounds with roaming werewolf packs, and of course there is the vampire’s oldest foe – the sun. Travel is dangerous as arrival at destination is never certain as one of the damned my meet their end under the talons of lupines, or the rays of the sun. And the cities aren’t that much safer. More people carried weapons that could pierce undead flesh. People were superstitious and more than a few powerful undead met final death at the hands of angry mobs. And of course, there is fire – the only light source after dark. Another mortal bane of the undead. Vampire: The Dark Ages is an incredibly hostile setting to play in with all the aforementioned hazards, as well as the inconvenience of the absence of technology or good hygene. However, there is another side to this story that makes the game appealing. People are superstitions, which can be hazardous as noted – see angry mob with pitch forks. However, it is also an opportunity for the enterprising player. Superstition can be husbanded to create blood cults, which is not uncommon in the setting. Superstition, managed correctly allows for a food supply and fanatical guards. Of course, that isn’t for everyone. However, other opportunities present themselves too. The world is predominantly feudal, with Lords the absolute masters of their domain. Perhaps they are answerrable to a king or the pope, but in the night to night running of things there are few that can gainsay their lord. And for an enterprising undead, it is not hugely difficult to insinuate yourself into a Lord’s circle to pull his strings, or take his throne. Some of the damned rule openly over mortal subjects, whilst the more canny keep to the shadows. And they get away with it more frequently as people are not ready to dismiss their fear of the dark. And there are few weapons available to them that would allow them to hunt and kill a vampire. No advanced surveillance tech to hunt the creature, and no incendiary rounds to burn it to ashes. But, they do have swords. And swords will do the job. I think Vampire: The Dark Ages appeals to me as I am a fan of fantasy, and history. I like the idea of having a character who lives in a cave, or who sleeps in a hidden nook of the castle cellar or whatever. And as I usually played deformed Nosferatu, I like a setting where my arts cannot be confounded by someone taking a selfie. For my style of play, the setting is much more appropriate. The setting is more challenging as well, as scale is a huge factor. The Undead tend to spook animals which means horse riding (whilst not unheard of) isn’t an easy skill to gain which means often you are limited to foot travel. Or learning the ability to talk to animals, to convince them you aren’t going to kill them. And, if that weren’t hard enough, more people carried bladed weapons which are a threat to the undead. In modern days, fists and even bullets (the regular kind) don’t pose any particular impediment to a Vampire, but a sword does. Where a bullet wound can almost be shrugged off, a sword pierces. And, more interestingly, you realise how much you come to rely on communications technology when it is removed from you. In a game of Vampire: The Masquerade, a technologically apt vampire might coordinate with their coterie via smartphone. In Dark Ages, I have to rely on Animal Messengers and Spies (My character doesn’t spook animals and can speak to them). If that weren’t bad enough, people still believe in monsters and Inquisitors of the Church stalk the night hunting vampires and other unholy creatures. However, it has other appeals that are difficult to match in a modern chronicle. For a start, if you want to truly play a vampire from Embrace to Elder, then you have the perfect setting for it. If you build a character that can survive, you might find your chronicle eventually reaches modern (or at least renaissance) times. And by that point you will have earned your powers, and built your network of spies or your business or your stronghold. Simply put, because it comes before modern times you have more of a sandbox to play in and more opportunity to build. Of course, it isn’t going to be easy as you will be vying for influence and territory against every other undead out there, but the potential still remains. It also feels more like a realistic learning curve. My brain rebels at how fast a character in modern setting develops through use of the experience system. It seems much more reasonably that things happen over a longer time. However, that is just a personal preference. And, it is an interesting time to play in as a lot of key events that set up the modern world (in Vampire: The Masquerade) happen in the Dark Ages setting. Two of the major clans in modern nights are birthed in the Dark Ages (The Game I currently play in is doing a Genesis of the Tremere story), and the societies of vampires that rule the night (so to speak) are birthed as a result of acts in the Dark Ages setting. These are all really cool stories to engage with. I have the Premium Hardback version of this book, which is expensive however it is fantastically durable. The cover is stunning and solid, the paper is pleasant to the touch. You can tell by feel that it is good quality. I have said high production quality in previous posts. I will say it again. This book has very high production quality. As for content, it is a huge book and is packed with a surprising amount of stuff in it. When I read the book I was expecting clans and bloodlines, however there were quite a few bloodlines of Vampire covered in the book that I had never heard of. And that was pretty cool as I like new stuff. It was really interesting reading about the standard clans outlook in the Dark Ages, reading up on the clans that died/disappeared in the Dark Ages and then finding the stuff I had never heard of before. Bonsam and Impundulu spring to mind. I was also pleasantly surprised to find a clan entry for the Nictuku. Whenever I played Vampire previously, the Nictuku were little more than a ghost story to frighten Nosferatu. People mentioned them in whispers but never in detail. And now I have description of them. It does take some of the mystery away, but I still like knowing. It would be fair to say that I was pleased at the amount of bloodlines and adversaries included in the book as it is always nice to give the players something unexpected. There is a huge catalogue of Vampiric Disciplines (their supernatural powers), including a quite comprehensive list of combination powers that are rarer and which add variety to your standard power set. So, if you want the power of invisibility, then it is the discipline Obfuscate for you. But, what if you want to be able to fade from recollection as well as senses? Well, there is a 4th level Obfuscate ability that might achieve that (It is hard to achieve this specific effect as the power is designed for other purpose), or there is a combination power called Memory Rift specifically designed to do that. (I know this one off the top of my head as I am aiming for it). As with every other core rulebook, this one has all the basic gameplay rules, examples and character creation guides. It also has a lot of handy NPC templates for things like knights or monks or random villagers that a player might encounter on their travels. Because of this, and my love of the historic fantasy genre, this is probably my favourite core rules set in the World of Darkness line of books. It has the rules of the base game, the setting appeals to me more and there just seems to be more stuff, more clans, more disciplines and more NPCs in it. A definite must for World of Darkness fans. I bought mine from DriveThruRPG and recommend them. The following image is an Affiliate Link. Any purchases made after clicking the link earn me a small commission and help keep this website running. First of all: This is a detailed, well-done, and informative review. Thank you for announcing it at https://www.storytellersvault.com.